This page contains the list of lessons on types of angles. It also covers the basics on angles. Each lesson consists of a math video, study tips and practice questions. 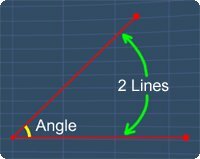 Learn about the basics on angles by watching the math video below. Using the protractor to measure angles. The Basics on Angles from MathExpression.com on Vimeo. In this lesson, we will learn about the basics on angles. Consider these 2 lines. When these 2 lines meet, an angle is formed. This is the vertex of the angle and these 2 lines are the arms of the angle. Now, this angle has a certain value. This value happens to be 50 degrees. Now, this symbol is the unit for angle. It is called 'degree'. Knowing this, let's rotate this arm, to find out the different values of this angle. Here, we can see that, the lowest value for this angle is 0 degree. Next, let's increase the angle. At this point, we have the angle as 90 degrees. Let's further increase the angle. Now, we have 180 degrees, 270 degrees, finally 360 degrees for a full rotation. Next, let's learn how to name an angle. We can label these 3 vertex as A, B and C respectively. Here, we can see that, this angle is between, A, B, and C.
With this, we can write, angle ABC equals to, 60 degrees. Now, if we name it as, angle CBA, it is still the same. Here, note that, the vertex of the angle is always the middle letter. Therefore, we can also write the angle B, equals to 60 degrees provided that, it is not ambiguous. That is all for this lesson.